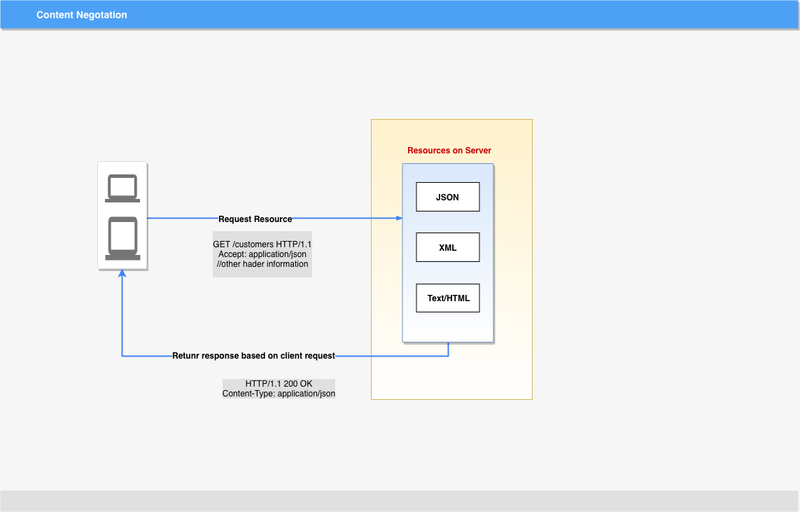 In the previous article of REST with Spring Series, we discussed HTTP Methods in RESTful Web Services.In this post, we will discuss content negotiation for a REST API. Content negotiation can happen at the server or client side.Below are the high-level details of both approaches. In the server-driven negotiation, a server process selects best representation for the response. For client-driven content negotiation, the client made the selection for the resource representation. Accept header: Determine what type of representation required on the client side. Server or client can send 415 status code(Unsupported media type) if they do not support the format sent in the request. Client or calling API can specify data format they accept in the response by using Accept header. Accept-Language: List of acceptable languages. Accept-Encoding: List of acceptable encodings. If the server cannot send data in a format requested in the Accept header, the server sends the 406 Not Acceptable error. URL extension or suffix is another content negotiation strategy used by multiple systems.Client API can use the extension or suffix in the resource URI to inform expected content type. Let’s take an example to understand this strategy. The first request will return XML response while the second request is for the JSON data. Similar to the Accept header strategy, server API use default content mechanism when the extension is not provided in the URL. We covered content negotiation in REST API. Spring MVC and Spring Boot support both strategies as described above. Spring MVC additionally support parameter based content negotiation. Please read our article Spring MVC Content Negotiation to understand the different strategy provided by Spring MVC.